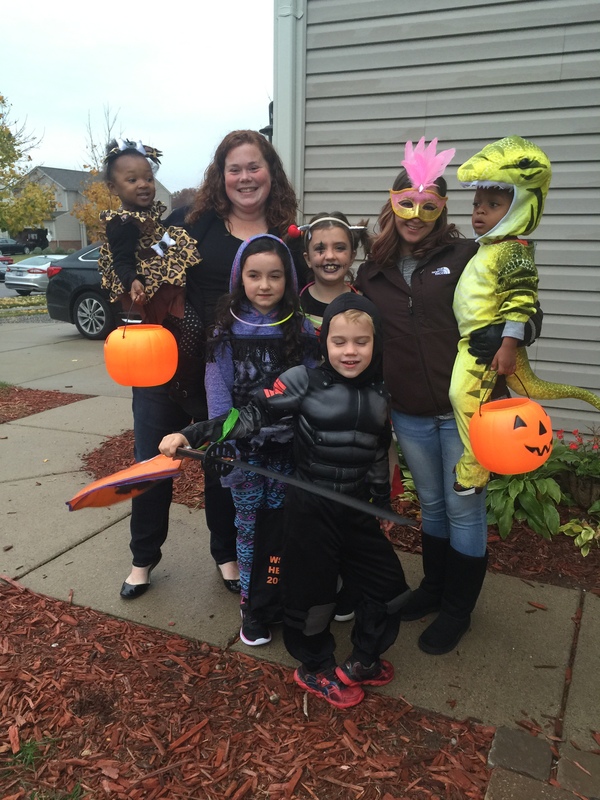 A Mother's Journey | My life as a biological, adoptive, foster and host mom. I’m going to let you in on a well-known secret: I don’t like to watch TV. I don’t like the lights. I don’t like the noise. And I hate realizing that I just lost 30 minutes of my day because I sat through an entire episode of Kid Danger- again. My aversion works well for my kids because, in general, I don’t torture them with boring, adult programming. They are free to argue amongst themselves about whether they want to watch Disney, Nick, Boomerang, or Cartoon Network. On rare occasions, I do take over the TV. My kids all moan as I turn on the History Channel or PBS. If I really want them to scatter, I turn on Downton Abbey. Nothing sends them fleeing like the theme song of that lovely, British drama. But even the lure of watching Maggie Smith play the Dowager Countess does not have me turning the TV on very often. I do have one show, though. One that has had me captivated from the first episode. One that I will fight to watch. Once a week, that TV is mine. And no, I don’t care if it IS the middle of March Madness. We do have a DVR, for goodness’ sake! I think those are clear instructions. What is difficult to understand about that? Why do they have such a hard time following those simple directives? Even their father warns them to leave me alone. It’s for one freaking hour! How hard is that? Apparently, too hard, as this week Shaun had a TOTAL meltdown ten minutes into my show because- get this- his ears were hot. What the heck? Mind you, he was fine all day. He had no pain, no swelling, nothing other than a slight redness on the tips of his ears that completely went away by the next morning. He had been in bed for almost an hour at that point. What could he possibly have been doing? Thank goodness for my DVR. Now, do you think the drama ended there? No. Lizzie, who is always worse at night, had a full flare-up. Her head started pounding. She started hallucinating and having delusions. Then, just for fun, she had a seizure. I had to fight to get her meds in her and then monitor her until she finally fell asleep on the small sofa. Again, my DVR came to the rescue. About the time my show was supposed to end, things calmed down enough for me to sit and watch. It was also about the time for Simon to go to bed. He was, as usual, in the basement irritating his big brothers. Trey and Joe took Simon’s bedtime as their moment to exact revenge. The hollering and riotous laughter made it nearly impossible for me to hear what was happening on my show. I had about had it. I threatened to take away everything they hold dear- namely, their electronics. My eyes shot daggers and smoke started escaping out my ears. Wisely, they backed away, into the kitchen to look for a snack while they waited to take control of my TV. Here’s the thing about Trey and Joe. They are low key and soft spoken all day long, but in the evening, they come to life. After 8 pm, the two of them are incapable of doing anything quietly, and their noise level rises exponentially when they are together. They barely escaped the evening with their lives- and more importantly, their electronics. So, I ask you, am I asking for too much? Should I give up on my time to escape reality to relax in a post-apocalyptic world ridden with Walkers and Saviors? I’m sorry. I can’t. I just love The Walking Dead. It’s been a while, as in over a year, a while. I needed time, a lot of time, to decide what I wanted to do with this blog. I never meant to be away this long, but time slipped away while I was caught up in this crazy life. I’ve thought of you often and thought about what I want to tell you. I don’t want you to get the wrong impression. 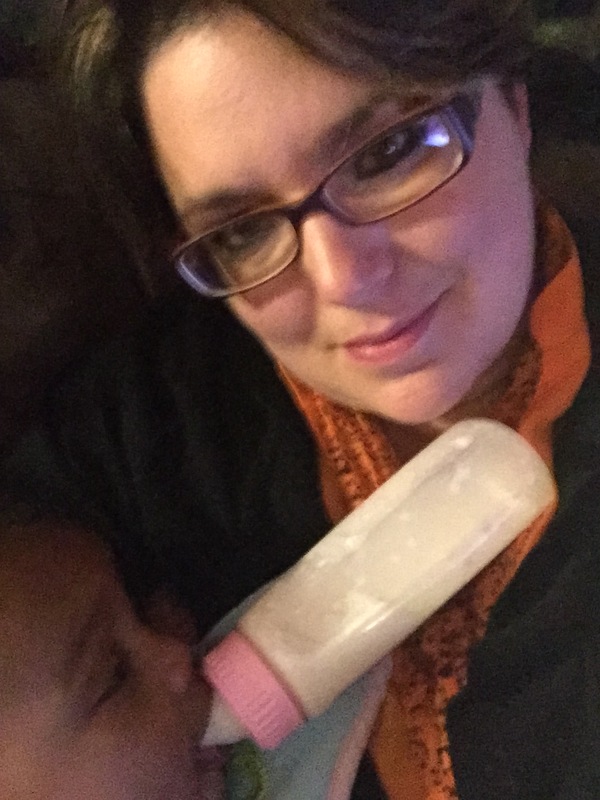 I don’t want you to think that I’m a perfect mom or that I have all of my stuff together. I want to be real with you, but I wonder if you are ready to hear what I have to say. This family is intense. We face some pretty heavy issues. Issues like mental illness, child abuse, abandonment, neglect, juvenile justice, addictions, disabilities and prejudice. Our family is fiercely committed to one another and we face these challenges together- head on. We are real people. We argue and swear. We are not politically correct. We are not environmentally friendly. We don’t eat organic. My kids eat too much sugar and watch too much TV. My children know more about the dark side of life than they should. We have too many pets. The house needs repair. My floors are wrecked and my sofas have rips. The kids’ rooms are a mess, I’m never caught up on laundry, and I hate to cook. I’m not here to give parenting advice or to receive it. I’m writing to tell our story in the hope that others may be encouraged to do something. I am not an extraordinary person. I do not have super powers. I am a mom that is fiercely in love with her family. We are a family that is committed to changing the world one orphan at a time. If I can make a difference, so can you. Find your purpose and do something! Sirius is ready to hibernate. Sirius has the right idea. Baby, it’s cold outside, and I plan to stay in. This morning I woke up to a dusting of snow on the ground. But the warnings had been given, and as the day progressed, the snow continued to fall. My little area of the world is now covered in white. The snow as of earlier this afternoon. I have a love/ hate relationship with winter. I do enjoy the coziness of a nice warm house with snow falling outside while cookies bake in the oven. It is fun to watch the little kids play in the snow, making snowmen and sledding down our hill. I also welcome any excuse to have another cup of coffee. But the joy is short lived. The kids spend less time outside than they do getting their gear on. Inevitably, a little one loses a mitten or a boot and comes in screaming with frozen fingers or toes. Snow ball fights end in hurt feelings and occasional bruises. Snowman wars end with dismembered snowfolks and whining children. And then when the outdoor fun is finished, they all come in and want hot cocoa. Do you know how big of a mess these kids can make with hot cocoa mix? Anyway, in an effort to make the best of the situation, we are starting our Christmas activities a little early. My tree won’t go up until after Thanksgiving, but the carols have been playing all day and now we are watching some of our favorite Christmas movies. Marie and SJ have begun to plan which cookies we should leave for Santa, even though there are no cookies in the house. My oven is warming- today is a good day to make brownies, I think. I’m determined to enjoy the winter, for now anyway. I have little ones that are full of excitement and wonder to enjoy it with. Expect me to have cabin fever by February. Princess enjoying her first snowfall. Today has been a big day for us. One that has been long awaited. This morning, the whole family piled into 4 vehicles and headed to the local county courthouse to take part in Mike’s adoption. He’s ours! He’s finally ours! Forever!!! It feels like I have been waiting for this day for ages; like Mike has always been mine and I have just been waiting for everyone else to realize it. This is the 4th adoption we have finalized. None have been easy. The adoption process is exhausting. Home studies are invasive. Foster parenting is tedious. But, oh my, this child is worth it. I love him. I always have. I always will. He is my son. Last evening, I sat at the end of the table and watched the chaos around me. There are currently 16 people staying in our home. We come from different races, cultures, and backgrounds. Some of us are biologically related, but we are all family. It was around dinner time and the commotion in the house, as usual, had reached its peak. Earlier in the week, Mr. M measured the sound level in our home during our normal dinner routine. It measured at 100 decibels. To put that in perspective, 100 decibels is equivalent to the noise of a chain saw, jackhammer, or a speeding express train. Thankfully, most of the day is not as chaotic as our evening routine. Often the kids are in different areas of the house or yard, doing their own thing. But dinner time in our home is gathering time. As a general rule, anyone at home is expected to come to dinner. Friday evening is less rigid, as it is traditionally sandwich night, and anyone big enough to reach the counter makes their own sandwich. Most of the family shows up around the same time anyway. They like the food and sometimes I suspect they like the company. So last evening, I sat and observed what I am usually in the middle of. 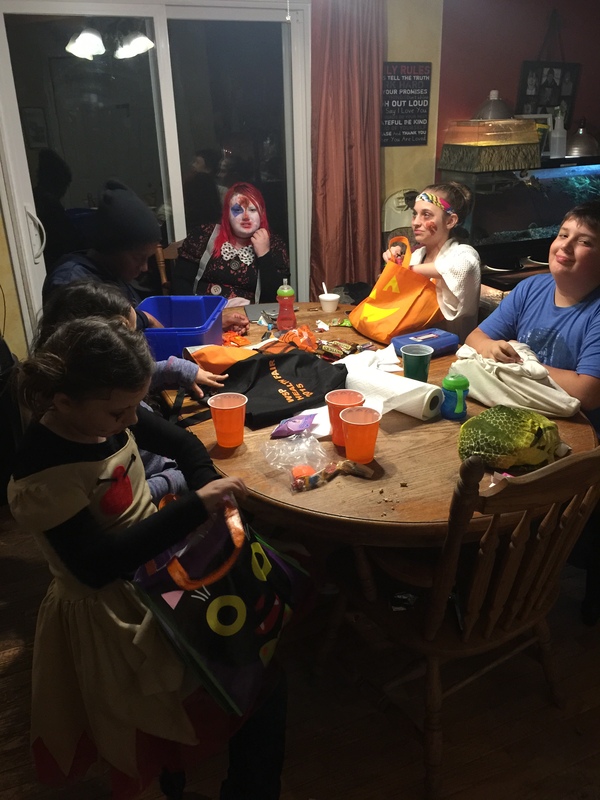 We numbered 15 as we gathered around the kitchen, snacking, laughing, bickering, teasing, chatting, preparing, and planning. The first thing I noticed was Love, walking around pulling her suitcase behind her. She was primped and perfect, ready to go visit her other grandmother for the weekend. Bea, her mama, was trying to keep Love looking pristine until she could pass her over to Goddess, which is what the other grandmother prefers to be called. Love did not share her mother’s concern as she was trying to sneak Doritos any chance she could. Over by the front door, Leo and Jimmy were playing a game where Jimmy would run toward Leo as Leo would run and jump over Jimmy. They both thought this was hysterical and their laughter filled the room. Marie and her best friend had just decided that they needed a new game on Marie’s iPod, so they were in the process of needling Mr. M until he would give in and install the game which they would soon tire of and would be deleted before the evening was through. Lu was standing in the middle of the room, holding Noel and Quincy by their leashes. She was prepared to go out with Mr. M for a while to train the two dogs in assistance work. While she was waiting, she was asking if her best friend could come over and spend the night. Alex was in the dog crate. He had been a bad dog and we all needed a break from his antics for a while. Sirius was looking longingly into the crate that he likes to nap in. Misha sat across the table from me, nursing a hard cider and trying to ignore the commotion around him. Mr. M was trying to explain to me in detail which computer he needed me to go buy later on that evening while he was chaperoning an event for Leo’s baseball team. Bea decided to come along and help me because we both understood the gravity of my mission. Eddie was walking around wearing his new, warm and fuzzy pajamas. He began bugging me to be able to come along to the store insisting he would carry the computer for me so I wouldn’t have to. Again, the gravity of our mission weighed heavily on us. Jimmy had tired of the game with Leo and had run over to the computer desk where he found a glass of water left unattended. He immediately spilled the water everywhere. Bea scolded Beth, our oldest daughter and newest addition to the house, because Beth had left the water there. Beth snapped at Bea. The two of them are currently sharing a room. Things can get tense between them. Beth took her baby and went downstairs. Jimmy was again skipping through the house when he suddenly noticed he needed to use the potty . . . a little too late. He stood still and said, “Oh, I peed.” We hurried to clean the mess. Love saw her opportunity and took it. She was up at the table reaching for handfuls of Doritos as Goddess pulled in the driveway. Bea was exasperated. Mr. M headed out the door with Leo, Lu, Noel, and Quincy. Eddie went to make a sandwich. Misha let Alex out of the crate. Bea began looking for super glue because Love broke Bea’s glasses earlier in the day. SJ came to the table when his whining didn’t get him what he wanted. He picked up his cup and started to slurp as loudly as he could. Eddie threatened violence if the slurping continued. SJ laughed. Jimmy had been climbing on Misha and saying, “Pow, pow, pow!” It’s their favorite saying. Then Jimmy got down to climb up to the counter and get some bacon. Misha asked Jimmy to get him some bacon as well. Jimmy ignored him. SJ started to slurp loudly again. Eddie stomped over and took SJ’s cup. The whining began again. Jimmy found another drink on the counter and accidentally spilled it. “Mommy, Jimmy’s sorry,” he said. Then he climbed down to go play with Alex. “Alex, sit! Good boy!” Alex stood by Jimmy’s side without a thought of sitting. Jimmy moved on to see what Princess was doing. Bea had put Princess in her car seat and sat her on the kitchen floor. Jimmy was loving on Princess when my 20 minutes were up. I passed Jimmy and SJ off to Misha and told Bea, Princess, and Eddie to get in the car. It was time to go get that computer. I sat in the courtroom, holding my son’s hand, both of our eyes fixed on the boy sitting in front of us. Our hearts were begging for mercy. The situation was beyond us. We had no control. My mind flashed to tender moments from the weeks before. We had had a hard time of it, but the tender moments gave me hope, kept me going. A cloud of sadness loomed over the courtroom. The boy sitting in the chair in front of me was no stranger to moments like this. Dark days had defined not only his life, but also the life of his brother sitting next to me. It had been a fight, but we had finally won the battle to get custody of Mike, his adoption scheduled for later this year. Mike was thriving for the first time in his life. We had so hoped the same would happen with his little brother. But, at least for now, it was not to be. The sadness inside had been too frightening for the boy; he chose anger instead. With anger he felt less vulnerable. We had been given six weeks to try to be a family. I treasure the memory of those weeks. There had been progress and glimmers of hope. But it had also been an exhausting journey. The boy needed so much. He watched my every move, searching for signs of insincerity. A battle raged in his mind– could this be real? Could he trust us not to give up on him when everyone else had? Would we be able to love him at his worst? Could he really be successful as a member of our strange and diverse family? He tested our limits and tried to make himself unlovable. He pushed me away all while watching to see if I would stay. I loved him harder as he continued to push. I also loved him carefully. Too much affection would frighten him and set him off. He had learned that adults could never be trusted. We had been walking a tight rope. Then there was that moment, the moment when rage blinded the boy I so badly want to call my own. He did not want to be this way, but as he became overwhelmed with emotion, he returned to old behaviors. Logic, love, hope, and trust were invisible to him in that moment. There was only rage, and the boy I love acted on that rage without an ability to think of the consequences. The storm blew over, but the damage was done. Thankfully, there were no physical injuries but the emotional ones were immense. There was damage to our house, but that didn’t matter. It did not compare to the pain in my heart. I saw the hope disappear from the boy’s eyes. We both knew that his chance was over. The court would take him away. So Mike and I sat, holding hands and daring to hope that the judge would make a decision that was different than the one we knew she had to make. But it was not to be. The boy we love was taken away before our eyes and we were powerless to stop it. Then, in the middle of the gloom, another ray of hope emerged. Our boy would not be allowed to come home immediately, but he would be able to receive another chance. There is a program designed to help children like him. If our boy completes the program, then he can come home again. Mike and I have a job to do. We need to keep on loving and encouraging our boy. He has work to do, and our job is to help him never give up on the hope of a family. This has been an unusual few days, even for us. Our normal chaos was rudely interrupted by several trips to the ER, a short hospital stay, two trips to urgent care, and multiple doctor visits. I have had more conversations about bodily functions than I care to count. We have had sleepless nights, fevers, chills, rashes, pinched nerves, infections, and kidney stones. My medicine cabinet could stock a small pharmacy, and because I’m the momma, I manage it all. It all started two weeks ago, when I started having upper abdominal pain. I tried to ignore it. Then Bea, my young adult daughter, started having severe pain and unusual symptoms. That was our first ER trip. She ended up having a UTI. I rested the best I could most of the next day. By evening, I was still having trouble consuming anything and the fever was back accompanied by a headache. I was still backed up, so I took my meds along with a laxative, and went to bed. Stupid, I know. By midnight, I woke up with horrible chills and stomach pains. Duh, right? The laxative had kicked in. Anyway, I took care of business, wrapped myself in blankets, and went back to bed. At three AM, I woke up with whole body tremors, terrible pain in my right foot, and a fever. I could not stop shaking. I woke Mr. M, and we headed back to the ER. By the time I got there, I could barely stand. They wheeled me back to a room and hooked me to monitors and an IV. My blood pressure was dangerously low, my pulse was really high and I had a low grade fever. The doctor came in and immediately admitted me for observation. It took two bags of IV fluid to get my body to stabilize. I spent the day resting in my peaceful hospital bed. The nurses would come in and apologize for it being a noisy and bustling place to rest and I would laugh at them. I don’t know how to rest in quiet. By the evening, I was feeling much better and all of my tests came back OK, so I was discharged. Apparently, I had somehow pinched a nerve in my right foot, but otherwise there were no new diagnoses. The next afternoon, I received a phone call from Marie’s school. She was in a lot of pain and needed to go home. I picked her up, gave her some Motrin and watched her symptoms. The next day, when she was still in pain, I took her to Urgent Care, where we discovered that Marie had a large and intense Candida rash from the prophylactic antibiotic she takes. Thankful that it was nothing more serious, we went home and I planned for a nice, peaceful weekend where we had no plans and everyone could recuperate. In the mean time, Bea had developed a Candida infection as well. I know that making plans rarely works out for me. I don’t know why I even try. At midnight, Jimmy had a nightmare and crawled into our bed. At three, Mike came in to our room complaining of horrible abdominal pain. I dragged myself out of bed and went to get him Motrin. By the time I got downstairs, Mike was doubled over and moaning in pain. I did a quick check of his symptoms, and when he pointed to his lower right side, I cursed under my breath and ran to get dressed. We headed to the hospital; by the time we got there, Mike was incoherent. A police officer helped me get Mike into a wheel chair, and we rushed him back into the ER. Mike has no recollection of the events that happened over the next hour or so. The doctor gave him several doses of pain meds before Mike was even able to talk. The nurses were taking bets over what could possibly be causing my boy so much pain. The tests came back — a kidney stone. The male nurse had won the bet. The doctor was fairly certain that Mike would be able to pass the stone on his own, so we were sent home with several prescriptions and instructions to see the urologist in two days. The next day was Sunday, and for the first time in over a week, everyone seemed to be stable. I took the day to relax a bit and catch up on some of the important things I had missed during the week. SJ’s birthday was coming up and I needed to prepare for that. I finished my course of antibiotics and made sure that Mike and Marie were taking the appropriate meds all day. Sunday was nice. Monday morning, I woke up determined to write a blog post, being that I hadn’t had a chance to write for over a week. I had missed the first week of my Blogging 201 class and my first week of Writing 101. I so badly wanted to catch up, but as I sat at my computer, my hands started to burn and tingle. Then they started to itch. I watched hives develop first on my hands and then they spread over my entire body. I hurried to take Zyrtec and Benadryl, but it didn’t help. Nothing I did calmed the reaction; thankfully, it hadn’t spread to my tongue or throat. I managed to make it through the day; I even took Mike to his urology appointment, though I scratched the whole time. That night was miserable. The hives grew into huge, swollen welts that stung and itched. I took Benadryl around the clock, but was hardly able to sleep. Yesterday morning, I went to my appointment with the police department to set up a safety plan for Lu. I managed to keep the scratching to a minimum and hid most of the welts under a hooded sweatshirt so nobody could see the rash. As soon as the appointment was over, I went straight to urgent care. It’s not usually a good sign when the urgent care doctor gasps when he looks at you, is it? Anyway, the doctor thinks I’m allergic to the antibiotic I was on. Unfortunately, the antibiotic stays in your system for up to two weeks after you finish the course. The doctor gave me a steroid shot, put me on a steroid burst, and told me to keep taking both the Zyrtec and Benadryl. He gave me strict instructions to head to the ER if my throat started to react. It took all day before I saw or felt any improvement, but it was SJ’s sixth birthday, so I had no time to sulk. This house is always bustling. I can’t stay down for long. We celebrated SJ last night. We enjoyed watching him play with his birthday presents. But as soon as it was time for him to go to bed, I went to bed too. It took a while for the itching to calm down enough for me to sleep, but at least I got to rest. This morning, my hives were much lighter. Thankfully, the steroid and Benadryl combination finally kicked in. Unfortunately, I woke up with a migraine, but I would take a migraine any day over full body hives. I had a follow up appointment with my doctor today. She just shook her head when she heard my story. I wonder what she would think if I told her the whole thing? Life is an adventure, isn’t it? I love my big family life. 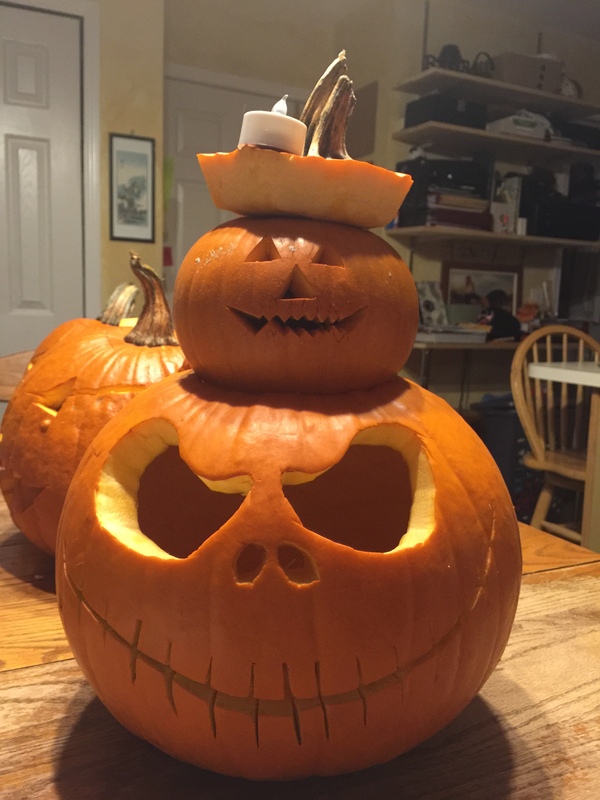 This year’s Jack O’ Lanterns ready to go. 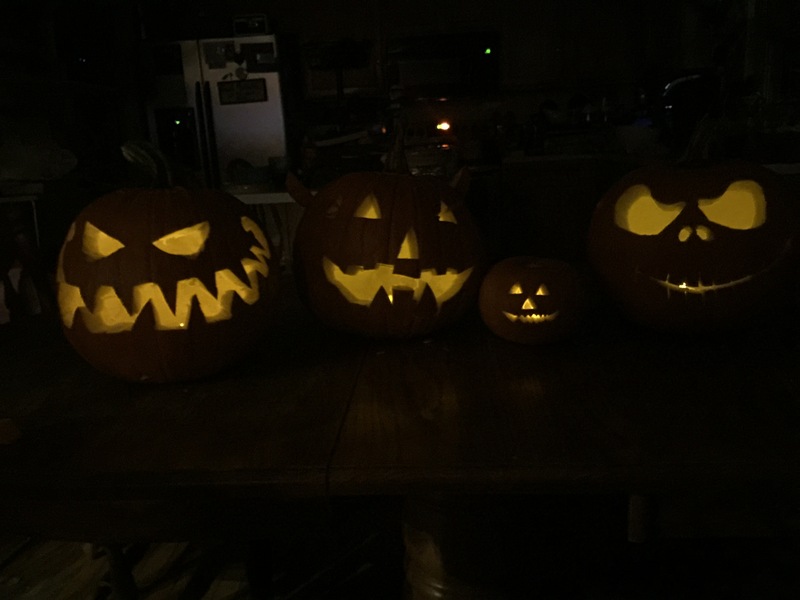 Excited children were up early playing with their pumpkins. 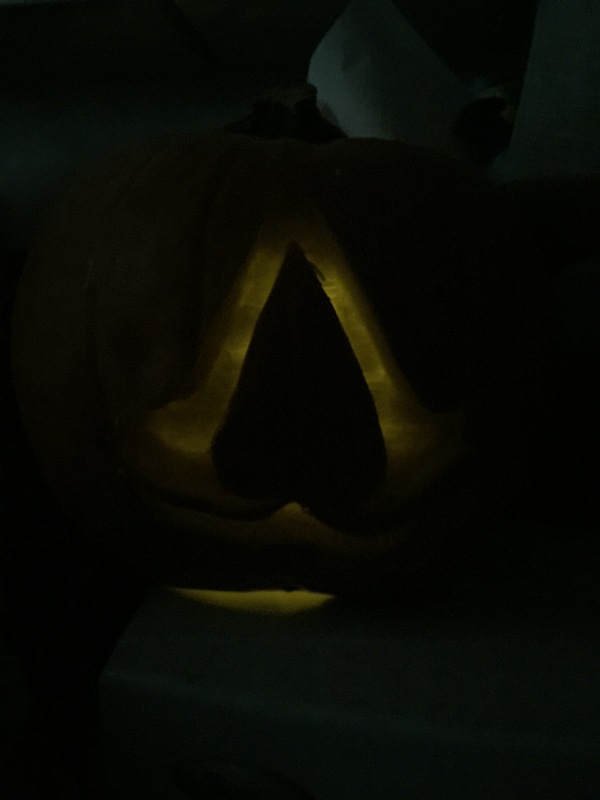 Leo needed to add an Assassin’s Creed pumpkin to the mix. 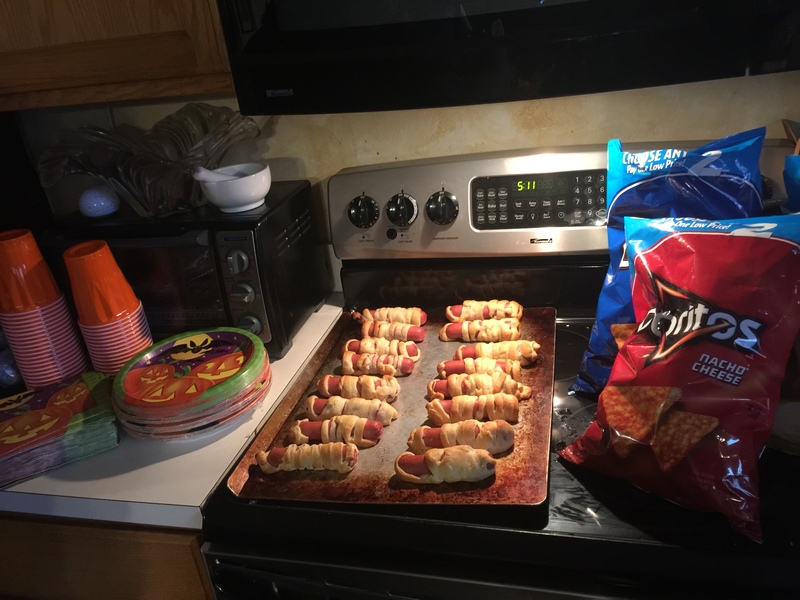 Mummy hotdogs are a tradition. 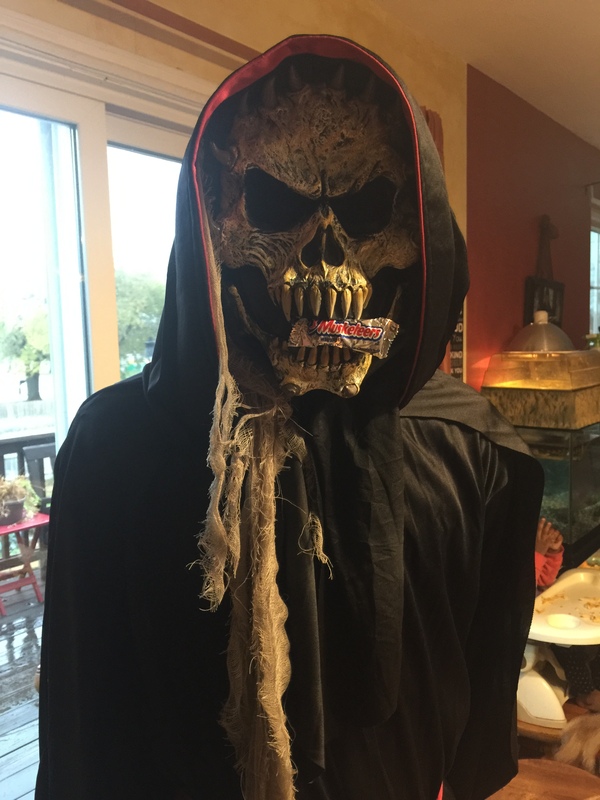 Mike couldn’t wait to get into the candy. 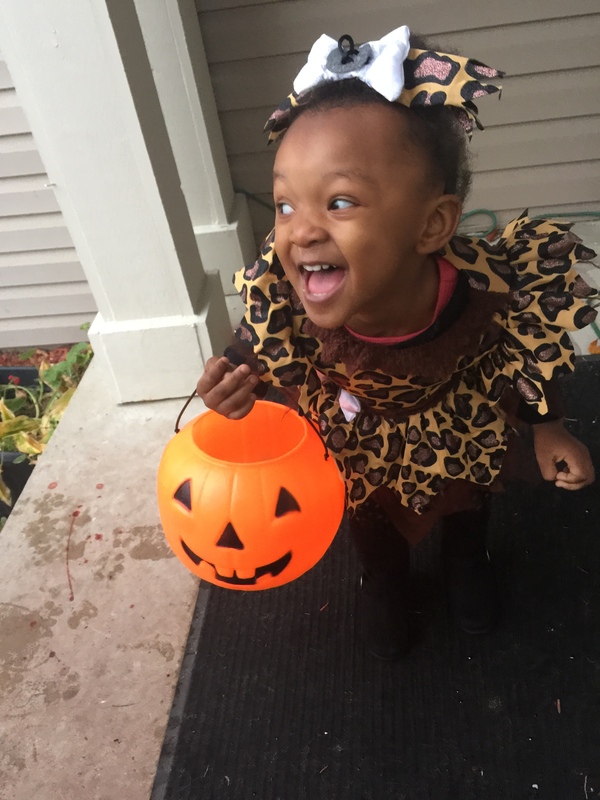 Love was so excited to go Trick or Treating. I couldn’t get either of their attention. 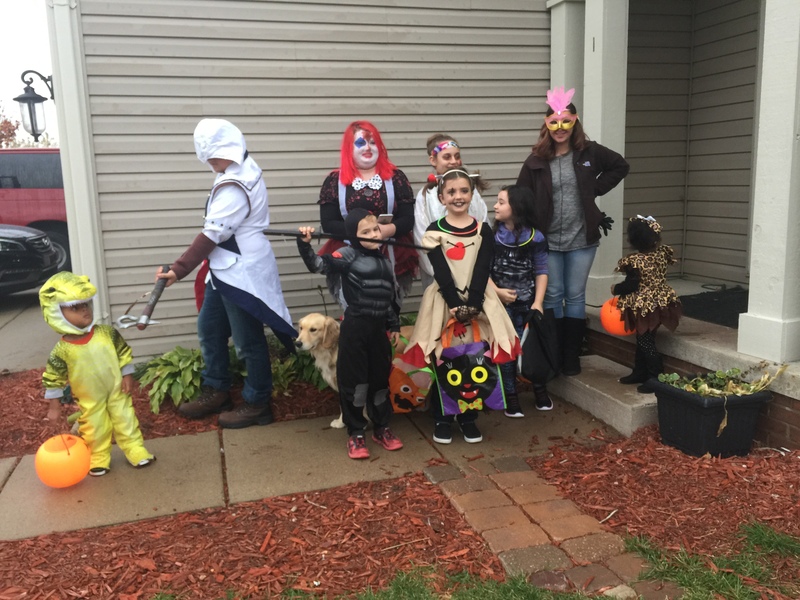 My best friend and sweetheart neighbor took this crew out Trick or Treating so I could hand out candy. My post. For an hour on Halloween our sub comes alive. 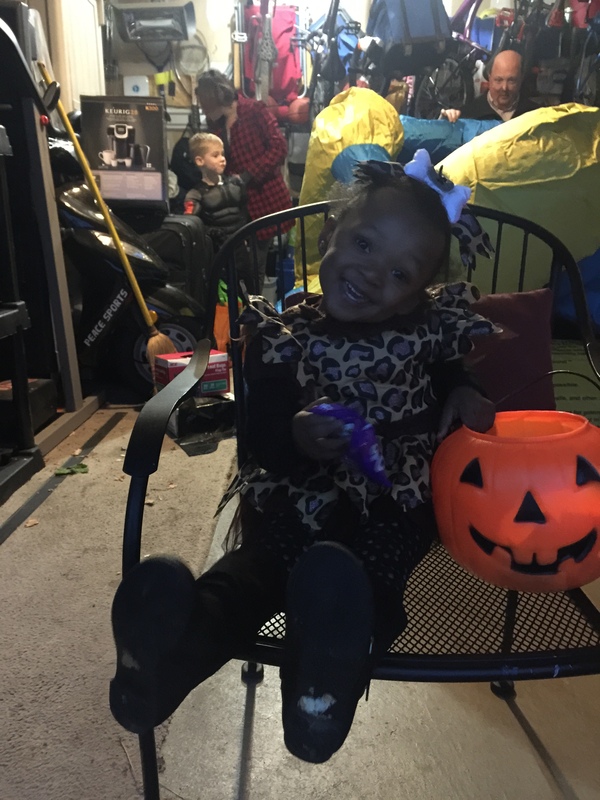 The streets line with Trick or Treaters of all ages. 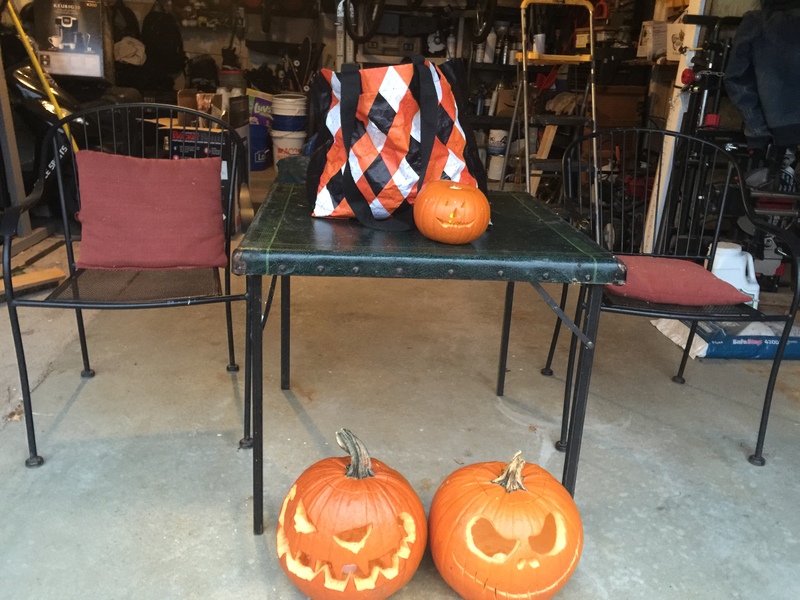 That big bag was full of candy. I went through all of it and had to go for my reserves. I probably handed out over 1,000 pieces of candy. The only point in the day that I got Jimmy to stay still long enough to get an OK picture. The bounce house overflowing with little ones. Adults were just trying to stay warm. The Trade and Tax Time. Kids go through their stash, trade and hoard, while adults collect a few of their favorites from each participant. As the night winds down, my middles watch “It’s the Great Pumpkin, Charlie Brown,” while I cuddle with my Princess. 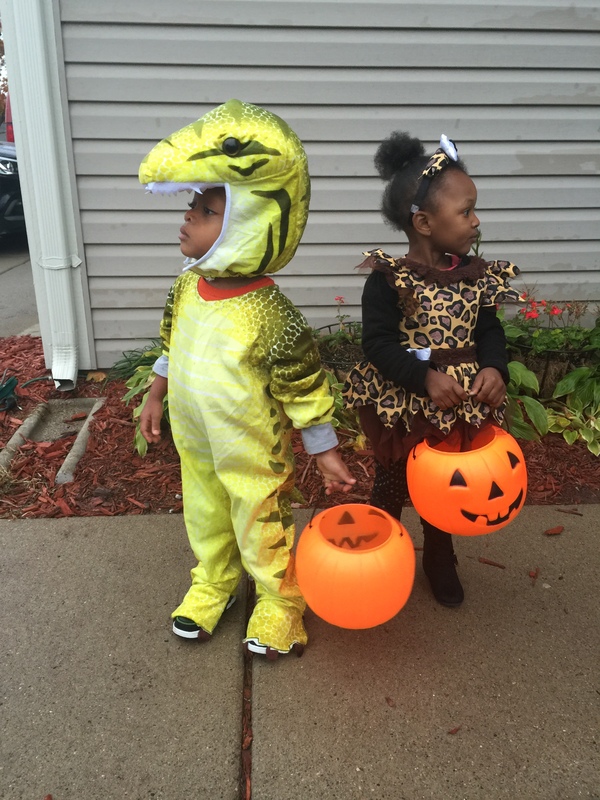 Another Halloween come and gone. Hope yours was a happy one. We encourage our kids to have friends over. It’s pretty common for there to be an extra kid or two hanging out for a few hours or spending the night. That’s why I didn’t think much of it when Mike brought a new friend home last Thursday after school. 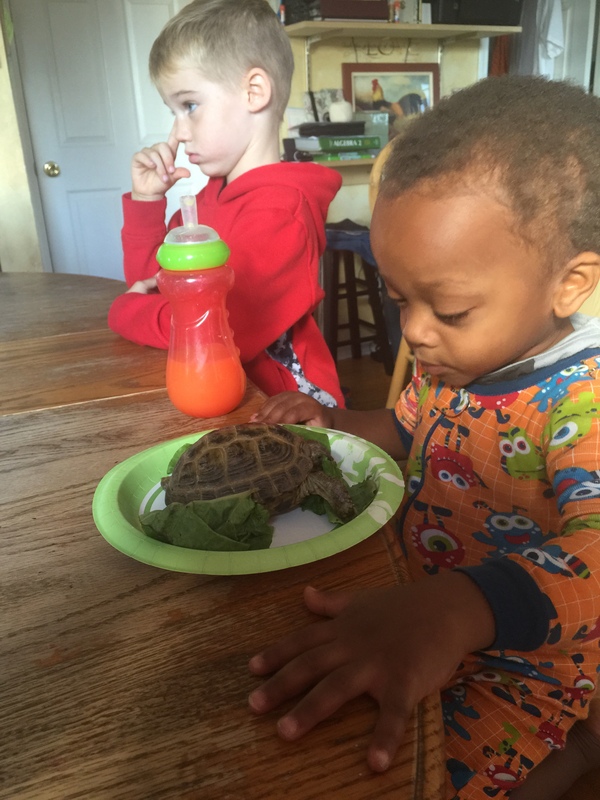 “Mom, this is my friend, Darius. Do you mind if we go downstairs and play video games for a while?” Mike asked. “Sure, sweetheart. Go ahead,” I replied, then I went back to making dinner. About an hour later, Mike came upstairs and told me that Darius was going to need a ride home. I thought that was strange, but sometimes Mike offers our help without checking with us first, so I didn’t think too much of it. I told Mike that we were busy then but someone could take Darius home after we were done with dinner. Darius texted his mother and let us know that she was ok with that. Later that evening, my husband drove the boys over to the apartment complex where Darius lives. When they got there, Darius noticed that his Mother’s car was not there. He texted her again and she replied that she had to leave and wanted to know if he could just spend the night at our house because he couldn’t get in his apartment. We thought that was weird, but we weren’t about to leave the boy alone in the parking lot, so he came back to our house and spent the night. On Friday morning before school, I pulled Darius aside and tried to get some more information about his home life. Mr. M and I had an uneasy feeling about the whole situation. As foster parents, we are required to report suspected abuse, but I refuse to make that call unless I am fairly certain abuse is actually happening. My gut told me that Darius was not being truthful, but I couldn’t tell what the truth was. Darius assured me that his mother would be picking him up later that day, then he and Mike left for school. Friday was a busy day in our town. It was homecoming week, and there were events all day long. I was busy taking care of My Littles and My Middles. Lu was not feeling well, and she was taking a lot of my attention. My Bigs and my Olders (whom I still need to write a post about) were all busy doing other things, so my day was completely consumed with caring for my family. Late in the afternoon, in the midst of the chaos, I noticed that Darius’s backpack was in the kitchen. A while later, Darius walked into the house with Mike. I asked him why he was here and not home. 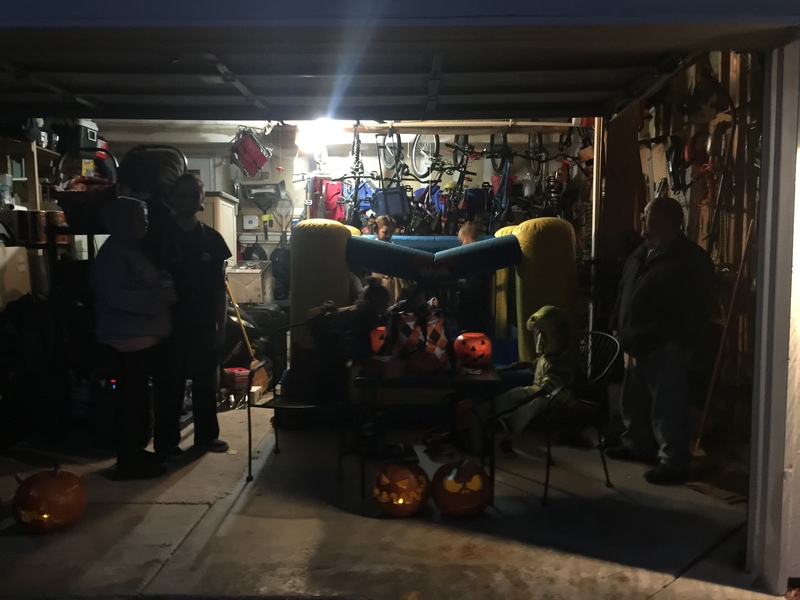 He explained that he was hanging out between homecoming activities and that he and Mike would be leaving for the parade and football game in a little while. His mother would be picking him up after the game. That seemed reasonable to me, so I wished him well and went back to my day. The rest of the evening was busy but typical, that is until bedtime. I was exhausted, but I waited for Mike to get home before climbing the stairs and heading to my bed. When Mike came home, he was not alone. Darius was with him. I looked at them both in utter amazement. Darius stammered. He explained that his mom never came to pick him up and when he texted her, she had told him that she had gone to work. He sheepishly asked if he could spend one more night, insisting that his mother would pick him up here when she got off work the next day. I shrugged and told him, “That’s fine, but when she picks you up tomorrow, I am going to talk to her.” Then I went to bed. The next morning, I woke up refreshed and determined to get to the bottom of our strange visitor’s story. I assumed he had been lying, but I was hoping to get a glimmer of the truth. I still was not sure if a call to protective services was warranted. I questioned Darius several times that day. I watched closely for signs of trauma and abuse. I repeatedly asked him what time his mother would be coming to get him, reminding him that I was determined to speak with her when she came. I had already asked for all of her contact information, but Darius was being less than helpful. 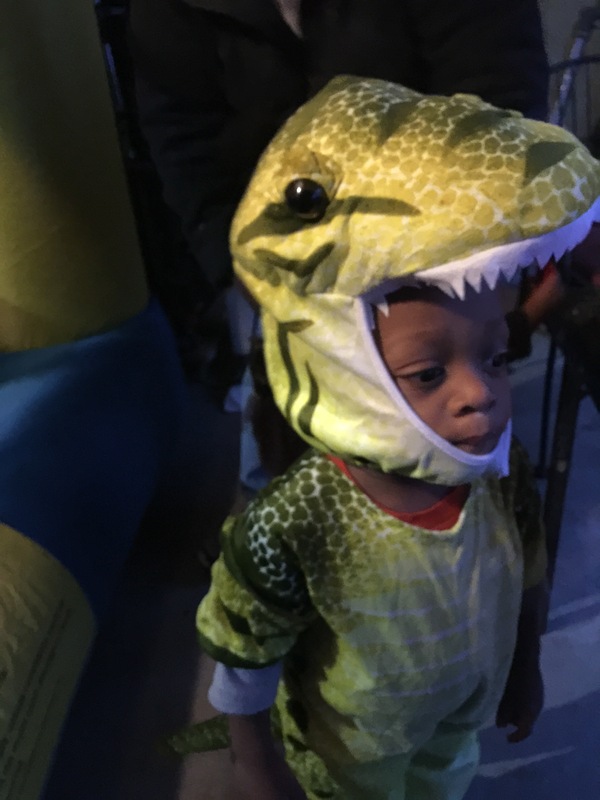 As the day wore on and the time came closer to when we were finally going to get to meet Darius’s mom, his story suddenly changed. Apparently, Darius’s mom had messaged him and needed him to be dropped off at the mall. I looked Darius in the eye and firmly explained that I would not allow that. He was not leaving my home until I met his mother. Darius squirmed. He stammered and came up with a lame excuse as to why he needed to be at the mall. I gave him another chance to be truthful, but got nowhere. I left Darius playing video games with Mike and went upstairs. Mr. M and I discussed all of the details and decided that since we really had no evidence of abuse, I would call the police. The police could take it from there. Not long after my call to the station, an officer arrived at our home. (I really need to bake our local officers cookies or something. It seems like they are out here to help us out quite a bit.) We called Darius upstairs. He seemed shocked to see an officer there waiting for him. Darius started with some of the same stories that he had given us. The officer had him collect his things and get in the cruiser. They were going to drive around until they found Darius’s mom. As they left, I breathed a sigh of relief. In the mean time, we had found a Facebook account that we were pretty certain belonged to Darius’s mother. We sent her a request. She responded the next day and asked why the police had been involved. I explained what had happened on our side. She explained her side, sending copies of the messages between herself and Darius. He had refused to go with her after school on Thursday and had gone to the basketball court instead. That is where he met Mike. Once he came to our house he decided he was going to stay here as long as he could. No one knows why. Some mysteries are never solved. If you came over to visit, you would notice that we have a lot of pets. I would totally buy a zoo if my husband would let me. For now, I am content begging him to buy me a farm – – just a little one. And of course, it would have to have a kennel and pond for our goldens. And I have to have chickens, maybe some goats, a dairy cow would be nice. But I digress. It is not unusual for me to remind Jimmy that he needs to leave Boris and his tank alone. Several times a day, I find Jimmy staring into Boris’s habitat, talking to him and telling him all sorts of important stories, most of which I can’t understand. But Boris and Jimmy have a relationship. 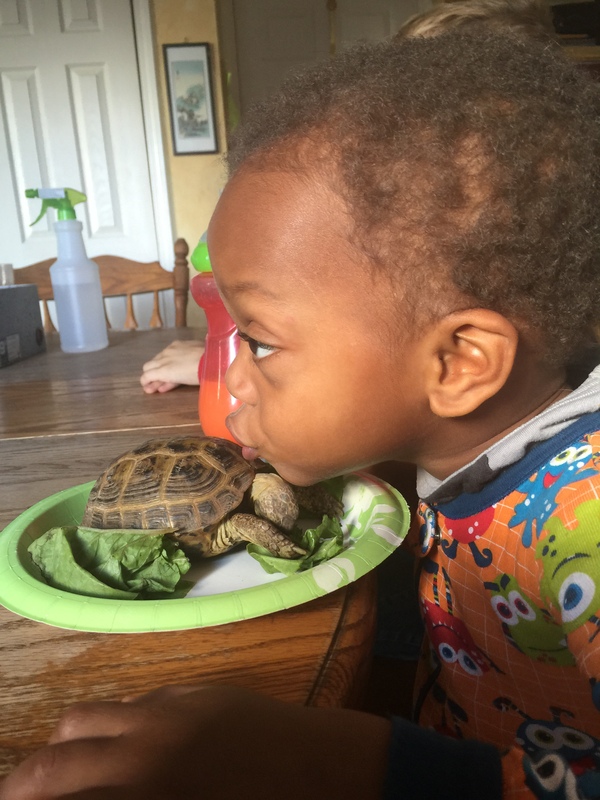 They are friends, and who am I to keep a boy separated from his tortoise pal? Though I do remove the toys and other paraphernalia that Jimmy sneaks into the tank on an almost daily basis. A friendship like theirs does have its challenges — mostly for me, though Jimmy would insist that I just don’t understand. Last weekend I wrote down some of the things I actually said during a Jimmy and Boris play date. 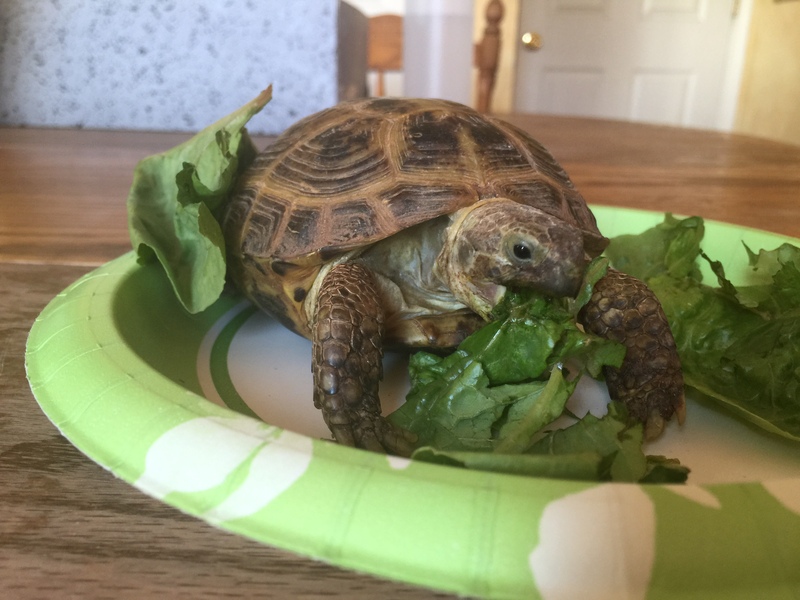 Boris is our resident vegetarian, which is good because at least someone here will eat some veggies. “No! Don’t write on Boris!” I don’t even know where the pen came from. I don’t think I looked away for a second. Jimmy trying to kiss Boris. Actually, Boris didn’t seem to want to return to his tank at all. He was fine and seemed to enjoy the crazy antics of the 2 year old that loves him. But I couldn’t take anymore. Jimmy keeps me busy. He is fun and inquisitive and a joy to be around, but that kid can get into mischief as fast as any I’ve ever seen. 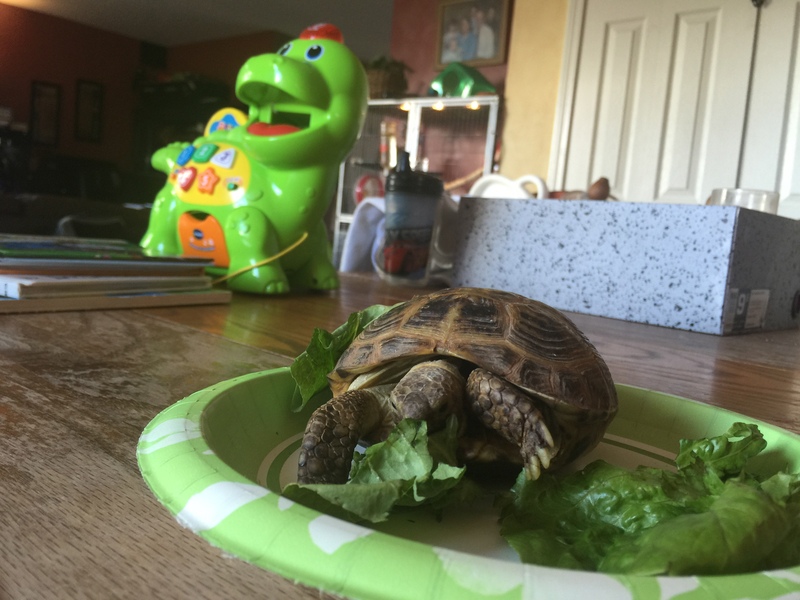 Wish me and my little Russian tortoise friend luck. We need it.